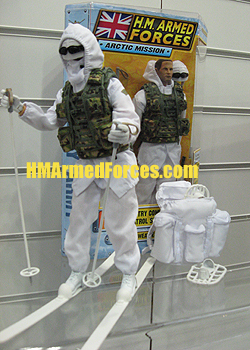 The Arctic Infantry Commando Ski Patrol Set is an HMAF Army Figure in the Arctic Mission range. HM Armed Forces figure the Army Arctic Commando is dressed in arctic whites with camouflage patrol vest and all white backpack. He also has a balaclava and removable helmet with snow goggles. For getting around the Arctic Commando comes complete with skis and ski poles as well as snow shoes. For protection Ski Patrol Commando comes with an arctic camouflage 5.56mm assault rifle. Also included in the Arctic Mission range is the RAF Forward Air Controller Arctic Equipment Set. With this accessory pack you get a set of arctic whites with white helmet, replacement white hands and boots to transform other HMAF figures into Arctic Mission ready combatants.